Saturday & Sunday, September 3rd & 4th, 10am-6pm. Hosted by Heidi Hunter of Runs With Scissors Studio, “Proutopia” is a pop up outdoor art market featuring Manitoba makers selling their wares under our beautiful prairie sky. 3044 Prout Road, 17E, west of Winnipeg Beach. I’ll be there and I hope you can come too! The sun always shines on Proutopia! 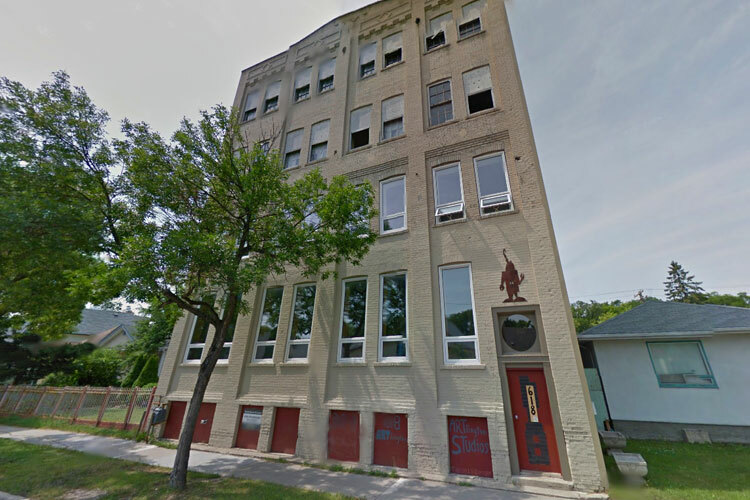 My studio is located at 618 Arlington, a four storey brick building which played home to a knitware company in times past. Today, it is three storeys of artist’s studios! Read here about how it’s been converted into artist’s studios. 618 will be hosting a public opening for a building wide show & art sale entitled ‘FULL SPECTRUM’ on the night of Nuit Blanche in Winnipeg, October 1st 7-midnight. White Night: Celebrate the arts, hope to see you there! My studio will be open, along with my studio mate Jessica Hodgson. See ‘Full Spectrum’ on the second floor and shop some ceramic/pottery work in our studio on the 3rd floor! April 22nd, Earth Day, I gave a talk on how I try to impact our planet in positive ways, and how I see humans fitting into and improving our environments. This relates to my art practice as the pieces I create are meant to help link us to their inspirations; the textures and feelings I see and experience as I travel outside, face to the sun, in our world. We are a part of what we create and I enjoy making vessels that connect us to the outdoors; be it off the grid or on the grid; submerged in untouched landscapes or city living. We play a role in all these situations and I am successful in communicating this idea when my work is bought and brought into living spaces, as our inherent connection to nature and everything we’ve been able to create from it’s resources can be thought of and remembered daily. Creating in the studio over the Winnipeg winter months always seems like my art hibernation; little contact with people, immersion in the work and the material; immersion in expression and new ideas. For me, it’s a time to cozy up inside and look out the window onto the white world; a time to explore the quietness of nature under it’s soft blanket of snow. And than spring comes……. I feel myself become more awake, alert to socializing and running free in the world. I feel myself shedding my layers, exposing my skin to the sun and welcoming in new, fresh energy and inviting connections once again. I’d love to see you at my Spring Mother’s Day sale; I’d love to connect, birth new ideas and spark new conversations as the cycle of seasons starts over, once again. Free parking on the street in front of the building. We are on the 3rd floor, contact me if you will need an elevator. I do not yet accept credit cards or debit. Cash or cheque preferred, however I can send you a payment request through paypal. The payment will have to go through before you leave the studio. The time is near; where we hold each other dear. I can taste the hint of winter in the air and it invigorates my senses. The stew is on the stove; warm and waiting for you with fresh sourdough buns; melted butter. The winter will wrap me in a warm and bright blanket of white; soft and healing. A fresh start is on the horizon. Join me for a winter sale at my studio. I have a new work. The series, ‘Once Upon a Winter Wander‘ draws inspiration from my wanderings in a white city during winter. And my texture series will flourish in abundance, as usual. elevator access available after a short flight of stairs. Street parking out front, free. Where: Winnipeg Art Gallery. I will be on the 2nd floor at booth #20. $5.00 to get in the door. I only take cash or cheque. There will be an ATM on site! Stay tuned for my annual holiday sale which will be happening on Saturday December 19th out of my studio at 618 Arlington Street. The full spectrum of my work will be available at this time. Don’t worry. I’ll keep you posted. Just in time for Mother’s Day! Watch my instagram feed in the coming week to see new work available at the sale! For those of you who have not been to my new studio yet, it’s in the block between Sargent and Ellice. Free street parking on the weekends. Look for a 4 storey warehouse building. It’s Christmas time again. Eggnog, stews, friends, snow, skating, rosy cheeks, skiing, warm light shining out through living room windows…. I could go on! I happen to love winter. And the holiday season! I feel it’s a time when people relax, let the day-to-day stresses go and truly realize what’s important – slowing down, listening to others and sharing in laughter and joy. 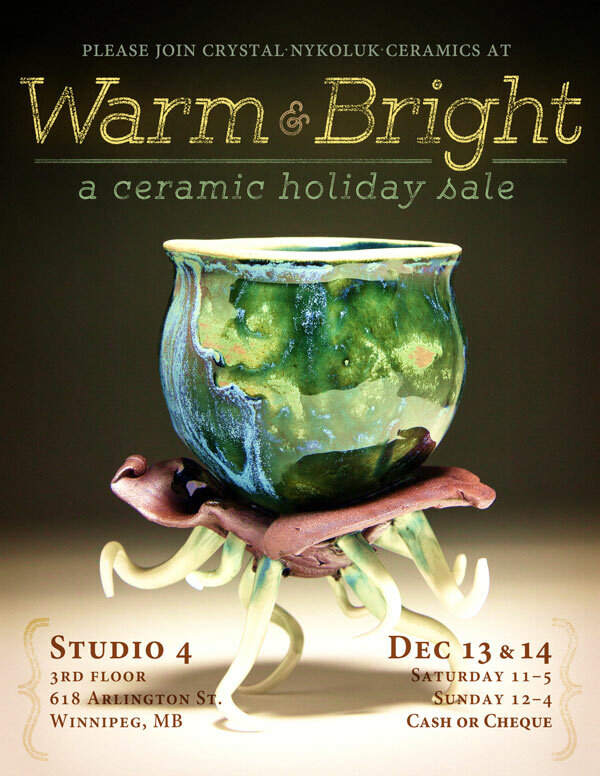 I also love this time of year as it’s when I have traditionally hosted my Holiday Sale of ceramic wares. This year will be no different! I moved my studio out of my home this past July to 618 Arlington Street, Winnipeg, which is where the show and sale will take place. The building I am in used to house a knitware manufacturer and has since been renovated into artist studios. My studio is on the 3rd floor. 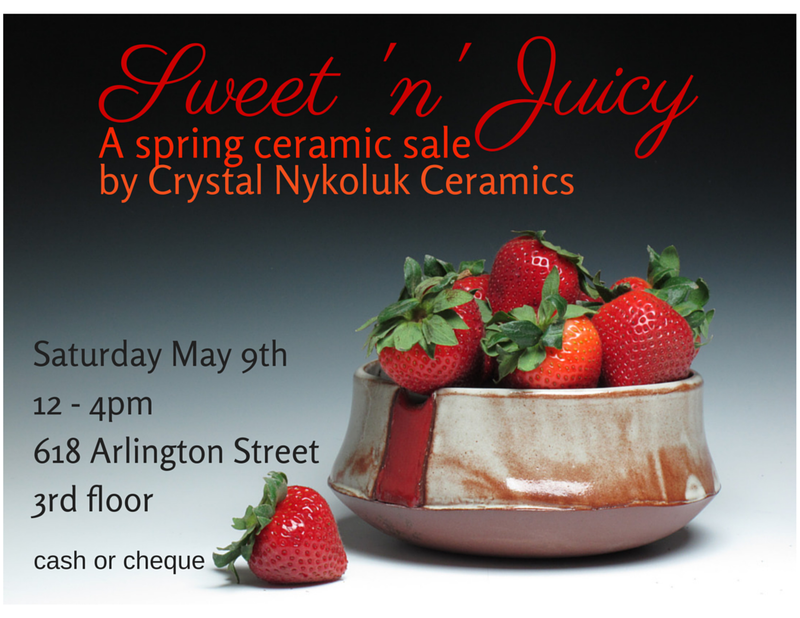 I am sharing with two other wonderful, talented and caring ceramic artists, Jessica Hodgson and Mallory Ryan who will also have their wares on display. Where: 618 Arlington Street *Parking is street parking so you may have to walk a bit! *I am located on the 3rd floor of the building! I’ve been busy in the studio over the loooooooooooog winter and am now pleased to Spring you news! My latest works will be featured at Gallery Lacosse for the month of May. 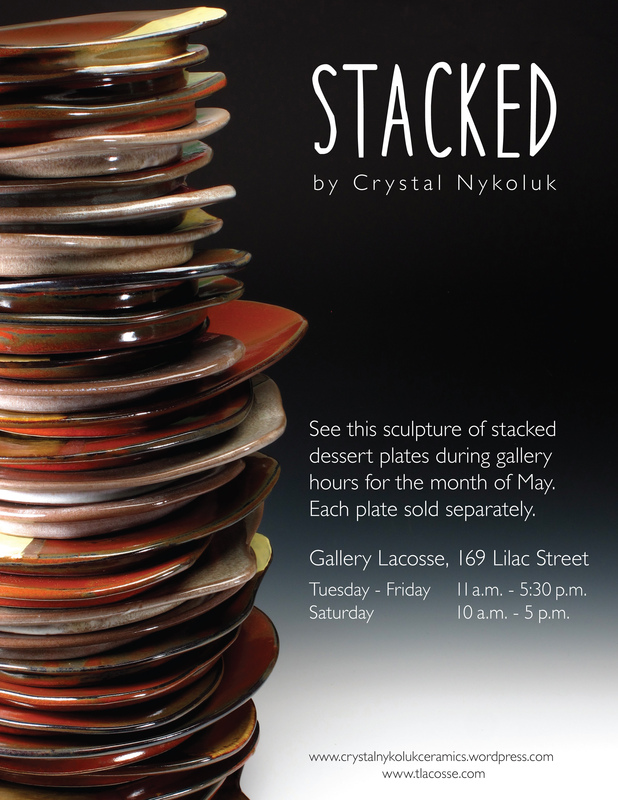 Along with my sculpturesque stack of dessert plates you will find an assortment of ceramic delights for your viewing pleasure. If you would like to meet me at the gallery during hours to discuss my work please send me an e-mail and I will be delighted to accommodate!